Last week, I received my copy of The Raven's Shadow from Architects of War, and have been absorbing the rules, and playing some solo practice battles. The second expansion to the SAGA game shows that Studio Tomahawk is willing to take the basic gameplay in some unexpected directions. Franks: The Battle Pool mechanic was one that I never quite understood when reading the early descriptions. When reading the book, it is not as complicated as it seemed. 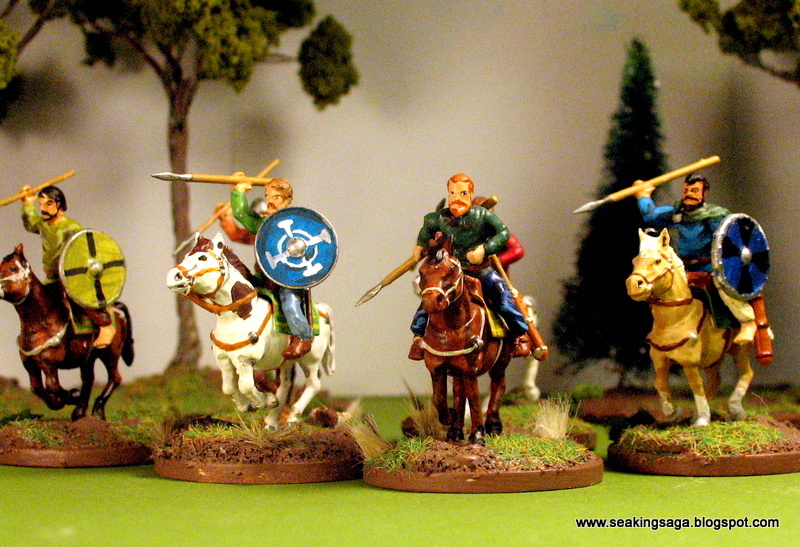 A player of the Franks has the ability to place up to three dice in the Battle Pool. The effectiveness of other abilities on the Battleboard depend on how many dice were allocated to the Battle Pool. This faction's challenge lies in the fact that one has to place dice in the Battle Pool, dice on abilities and still have enough dice left over to activate units. 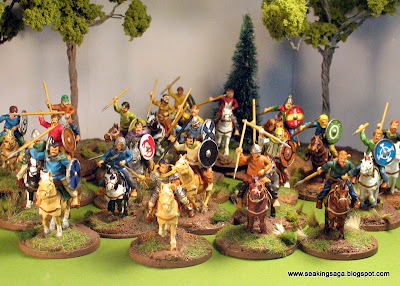 Players using the Franks will probably use larger units and depend on the We Obey rule. 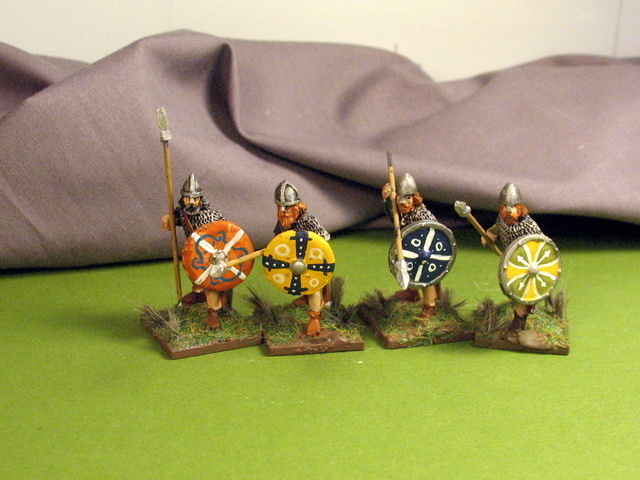 In fact, the Frankish hero Charlemagne can activate up to three units at a L distance as one of his special abilities. If you are like me, and like to play quick four or five point games, I am afraid the Franks would be of limited use in such situations. Irish: Similar to the Welsh in that they are lightly protected fighters who must take advantage of the terrain, the Irish faction shows some serious modifications to the rules. Hero characters called the Curadh are able to operate independently of units and fight as individual warlords to a degree. Norse Gael - A Viking faction, and like the Jomsvikings from the previous supplement, its variation is in giving the opposing player a choice. Instead of increasing wrath, the choice is a single combat challenge between a Norse Gael figure and an enemy figure. Winning the combat allows the Norse Gael player to unlock special abilities. Strathclyde Welsh - a interesting faction choice, for it was a small kingdom that was eventually absorbed into Scotland in the early eleventh century. The units are not all required to be mounted as I previously assumed, but their new abilities depend upon mounted units. In this case, the new feature is off-table units. With proper activation, they can enter the battlboard from any side, and another ability allows them to make a shooting attack from off the board, if an enemy is within L of the table edge. Should SAGA move into the East, this would be a useful mechanic to handle steppe factions such as Seljuks or the Pechenegs. The evolution of the rules in The Raven's Shadow does have the potential to slow the game down some, especially with the insertion of more Reaction based abilities, but that should decrease as players become more accustomed to the process. The faction choices are good, but one must decide what is right for their style of play. The Franks require an efficient and calculating manager. The Irish will be favored by the gambling player, who is willing to take a chance on big victories if a "6" can be rolled. The Norse Gael have some of the most interesting Hero abilities (Brodir of Man's seer powers seem quite fun) but Challenges may be gimmicky like the Jomsviking's wrath. My preferred faction from this update will most likely be the Strathclyde, because I am eager to see how the off table abilities play out. 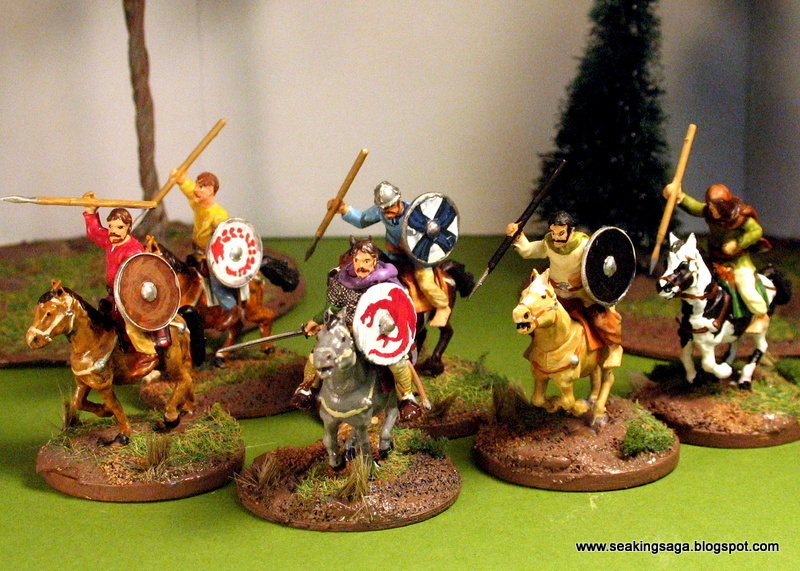 Mounted Welsh kit bashed from two boxes of Wargames Factory Ancient Germans with Saxon and Viking heads and weapons. I added javelin quivers and green stuff cloaks to a few. Not the paint work I am most proud of, but I did manage to complete about 18 mounted figures in a week. Pictured below is all 24, which is three points worth of warriors. Adding in a unit of levies and two hearthguards will be the final warband. A small confession on the advent of the SAGA expansion, Raven's Shadow - I have not yet played any of the factions from the last expansion, Northern Fury. When I got back into gaming after a long absence, I filled my shelves with Vikings and Saxons (thank you, Bernard Cornwell). An itch for Normans hit me after buying SAGA and reading some Jack Ludlow. After turning some Wargames Factory Ancient Germans into Welsh, I have ended up with at least 6 points of all four original factions. 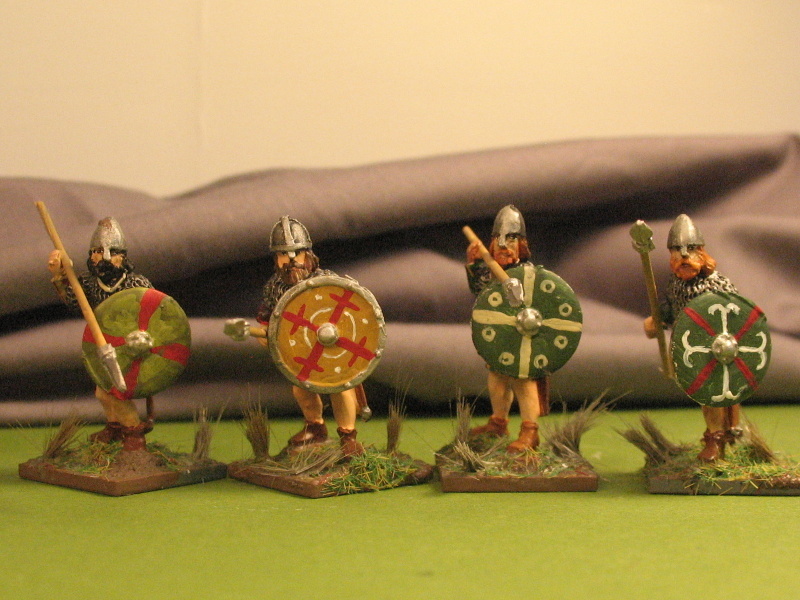 Then came the Jomsvikings, Anglo-Saxons, Bretons and Scots. Obviously, the first three are analogous to original factions, with some differences. The Jomsviking wrath mechanic was interesting, but gimmicky. 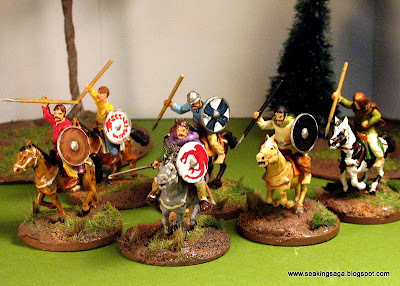 The Anglo-Saxon battleboard, with bonuses for large units, does not suit my style of play and the Bretons...liked them, painted a unit of skirmishers, and have every intention of getting them on the table. Which brings me to the Scots. The Scots battleboard is intriguing, and seems to demand a bit more forethought and strategic positioning of your forces. 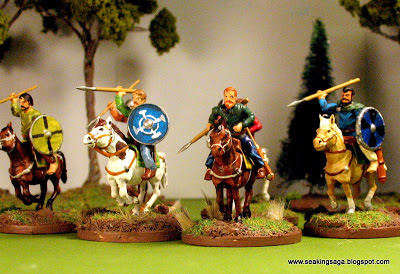 Hopefully, my game next weekend can be a four point match up, with two hearthguards and two warriors. I was not able to find any conclusive or well documented depiction of pre-heraldic Scottish shield designs on the net. So I went with vaguely Viking designs with some Celtic influence, borrowing liberally from a few other blogging wargamers. Clarkson, Tim, The Makers of Scotland: Picts, Romans, Gaels and Vikings. A highly readable look at the evolution of Scotland from pre-Roman times until roughly the year 1000. The first third of the book suffers a bit from the authors attempt to weigh primary sources and chronicles, and ends up focusing on royal names and succession, rather than on the peoples and cultures promised in the title. After working through this, Clarkson ends up delivering some valuable information about the development of the Scots, culturally and politically. 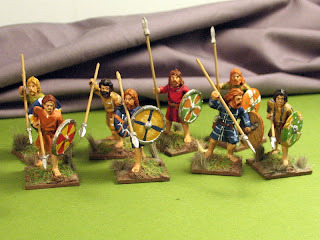 As a further inticement to SAGA players, the the forthcoming faction the Strathclyde Welsh also play a prominent role. Dunnett, Dorothy, King Hereafter. Previously recommended, a historical novel in which Dunnett proposes that Macbeth and Thorfinn of Orkney were not cousins (or half-brothers) but one in the same.